The Louloudi Villa looks down a hillside of silver olive trees, over the waterfront houses of Gaios port to the forested offshore island of St Nicholas. 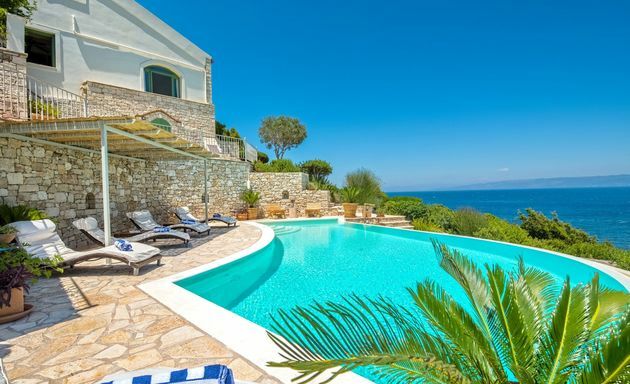 Villa Maestro is above Paxos' east coast beaches of Monodendri and Lakkos. Villa Maria is a modern, comfortable and spacious house with a private hilltop location overlooking the west coast. 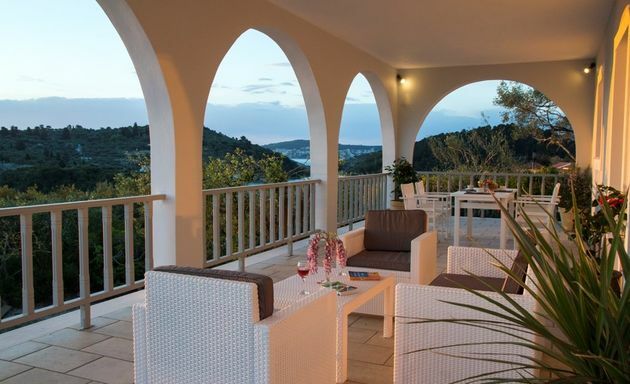 Villa Marina and its extensive, private grounds overlook Mogonisi Bay at the southern tip of Paxos. 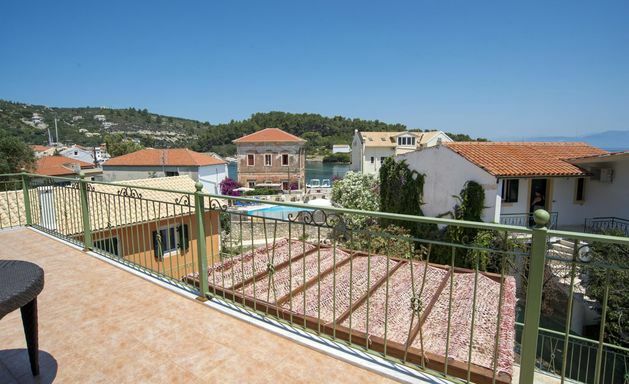 We think that Mermaid Cottage has the best location in Loggos and if you want a private balcony immediately over the sea - then possibly the best location on Paxos. Mimosa House is set back about 50 metres from the Gaios waterfront and is just a 5 minute walk from the main square of Gaios. 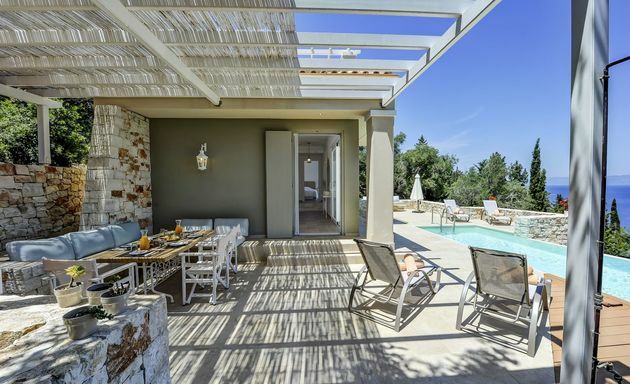 Villa Narkissa is on a hillside of olive groves just 250 metres above Monodendri beach on Paxos' east coast. 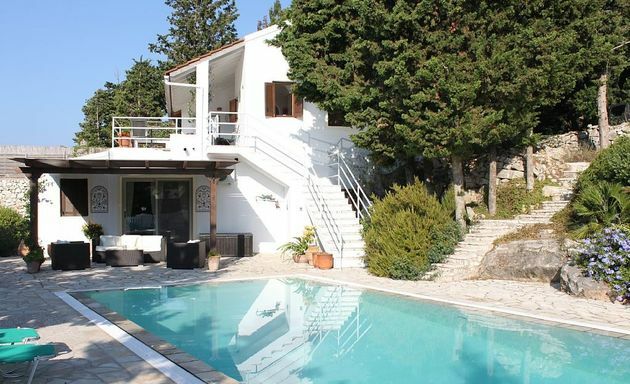 Villa Pandora is hidden away on the west coast amongst tall cypress trees with views over the surrounding hillsides of olive and pine trees and out to sea. Petrino Spiti hides away in large terraced gardens, surrounded by olive groves, close to Paxos' west coast. 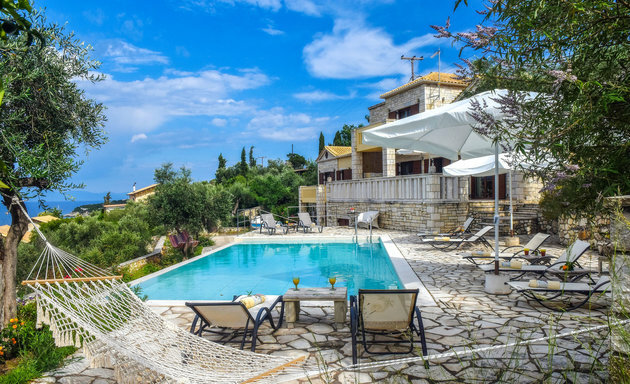 Villa Polimnia is a peaceful, private hideaway just over a kilometre away from the pretty port of Loggos. Villa Poppy stands on a hillside of tall cypress trees in the small and peaceful hamlet of Boikatika, above the west coast. Views are over the surrounding hillsides of olive and pine trees. On clear days the southern islands of Lefkas and Cephalonia are visible. Portokali hides away close to the west coast of Paxos, just a 10 minute walk to Magazia's tavernas. 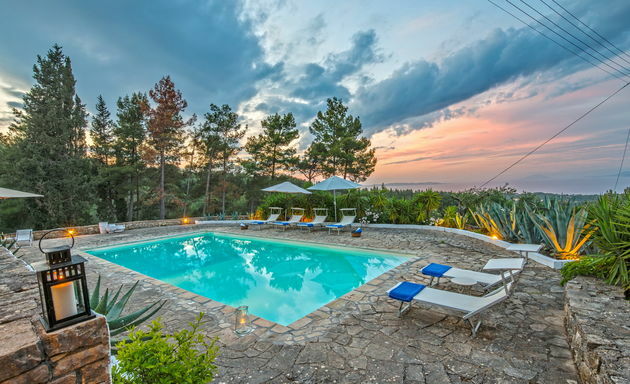 Villa Priscilla has a private hillside position overlooking Mogonisi Bay close to the southern tip of Paxos. Villa Rodi has a hilltop position above Mogonisi Bay, at the southern tip of Paxos, surrounded by olive and cypress trees. 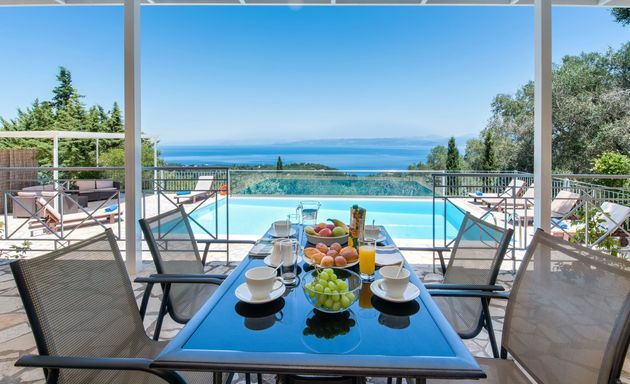 Villa Rosa has a private hillside location with views over the fjord-like entrance to Gaios port and across the sea to the mountains of the Greek mainland. 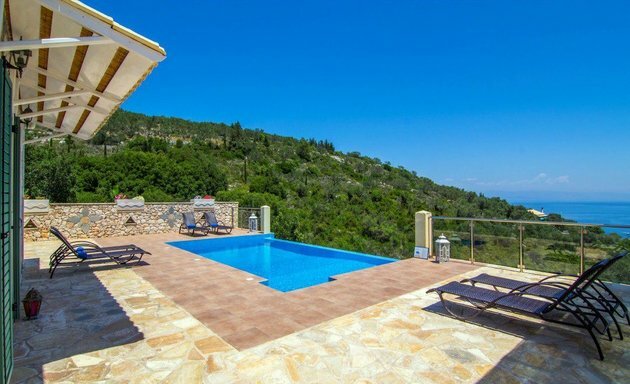 The villa has a special coastal position above the sea on the east coast of Paxos, just a few bays north of Gaios. Villa Santolina sits privately on a hillside of olive groves 100 metres away from the track leading to Monodendri beach. The Serifos Apartments are on the outskirts of the port of Loggos, just 300 metres away from the waterfront. 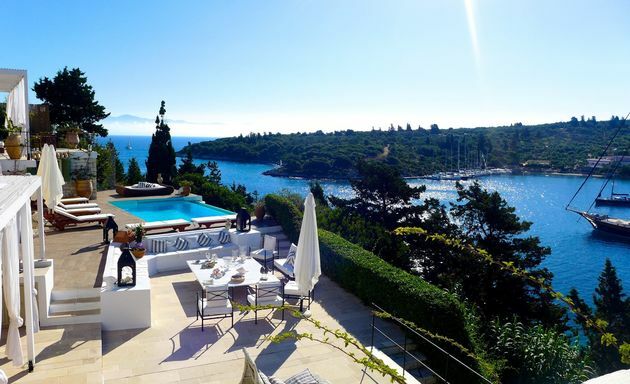 Villa Simeoni looks out across the sea to the Greek mainland and along Paxos’ east coastline. Just three bays south from Loggos, Villa Spiantzi is uniquely situated on its own east coast promontory just above a beach.